I also opened a small "Elbo Room" bar in the basement of a restaurant I owned in the small town of Kenbridge, Virginia in the late 70's... my family and myself operated this bar and restaurant for approx. 10 years. with live bands and good clean fun for the surrounding area. New Elbo Room App is Live on Google Play! On our new Elbo Room app, customers can watch the live cameras of the bands, beach and bar while listening to the Elbo Room streaming Classic Rock Radio station in the app anywhere on earth. Best Happy Hour on Fort Lauderdale Beach! ElboRoom.com now works on ALL Smartphones! 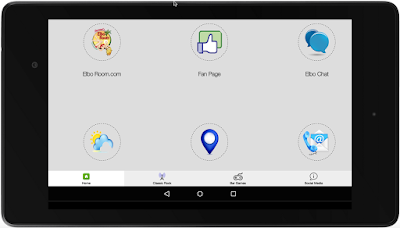 Now from any smart phone you can visit www.ElboRoom.com and watch the LIVE Cameras, Update your ElboRoom.com Blog, photos and Status update! Skip on Down to the Best Halloween Party @ The Elbo Room Tonight! ..was indeed a memorable one. Connie Francis singing "Where the Boys Are" on the radio just now brought it all back once again. For I was there during spring break 1960, and working just above the famous Elbo Room nearly a decade later was quite a nostalgia trip. Now 3 decades on I can make it recursive, watching the action on a web cam or walking the pathways of my yesteryear on Google street view from here in California. Nostalgia ain't what it used to be; it's better! Expect some changes in the Weather Friday for our "End of the World" Party at the Elbo Room. We were rated #1 Place for the End of the World Party back in October 23rd! i Nostradamus Predicts the Best End of the World parties around the world! As the world gets ready for the best and maybe last party of a lifetime, i Nostradamus asks why not the the most exotic places on earth? Hurricane Sandy Party at Elbo Room starting today at 12 noon! Hurricane Sandy Party at Elbo Room!